It is French Friday again and, we are making Salmon and Tomatoes en Papillote. En Papillote refers to a method of cooking, a technique where food (vegetables or fish usually) is placed in a packet made out of parchment or foil to cook in the oven. This technique actually steams the food. It is really very simple and quick. Dories recipe calls for some basil leaves in the center of a 12 inch square piece of foil. Then salt and pepper the leaves and place salmon on top. A bit of olive oil over the fish, some grated lemon zest, a handful of grape tomatoes on the side and, a sprinkle of lemon juice. Finish it off with a few slices of lemon, and herbs. I used rosemary and some chopped scallions. Add a bit more olive oil and close the packet. That's it…this cooks for about 10 minutes and is absolutely wonderful! Another winner from Dorie! I so enjoyed the easy cooking technique. It is hot and humid here and no one wants to spend hours preparing dinner! No messy cleanup either…the foil gets tossed! I served a nice salad and some french bread on the side. I had never tried this method for cooking fish before but, I will be using it from now on. Loved the juice that surrounds the fish when it's done cooking. Aromatic and so delicious! If you haven't gotten Dories book Around My French Table yet, you should check it out! And check out what other Dorie cooks did with this one! 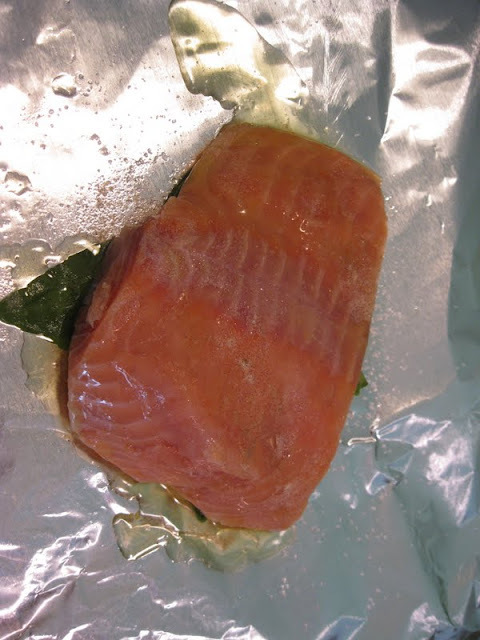 Enclose in foil…leave room for fish to steam…and bake at 475° for 10 minutes or longer if you like your fish done well. Kathy-this is so perfect, moist, beautiful, and absolutely divine delicious salmon done to perfection...I would not leave it a minute longer than 10 minutes. Superb!!! Beautiful, as always, Kathy! I wish we lived closer so you could share some photography hints with me! Your pictures are always great! Have a wonderful weekend! Beautiful photos! I'm going to get fresh fish and try it again. Hi Kathy, This is my favorite way to make salmon! So easy and always turns out perfect! I have been trying to comment from my computer without luck...this try is from my phone!! Apart from the portion I plated to be photographed, the rest of our salmon were eaten on top of their foil packets. And you're right, this is the easiest dish to prepare and there's no cleaning up afterwards! Your dish and process photos look amazing! Great post! Great photos. I love rosemary so much I think I will use it next time. I really can't think of an herb that would not be correct for this one. Thank you for stopping by my blog, it led me to yours! Your completed recipe looks wonderful (I wish I had added a couple more of those little tomatoes as 4 little ones left me wanting one or two more, maybe three!) and your process photos are really great. This was a hit at our house, too. It looks so delicious. I am looking forward to making this soon! Beautiful! I love your "before" photos. This method also works great on the grill. I love all the flavors that you used. Thanks! Kathy...this is indeed a winner. Love the simple preparation!I yours look great and your pics are great :) I will definitely make this again! Looks gorgeous, Kathy! I never tried cooking fish this way before either, but know I'll be doing it again. It came out perfectly. Have a great week. What a beautiful dish! I love how it all looks assembled together! Yay for minimal cleanup! You are right, the resulting combination of the lemon, olive, and fish juices are wonderful. My kids LOVE this dish. It is their favorite way of cooking fish. I've used parchment paper before and torn it open right on the plate. They think eating this way is fun and quirky. I love minimal clean-up dinners. And this one looks refreshing and light and the flavors sound deliciously clean. Yum! I've been seeing a few of these foil packs on the grill and yours in the oven. I like how the fish remains so moist and tender. And of course, the minimal cleanup is great in the summer!